With a small team, the news outlet has been able to monetise the audio show in a saturated market. 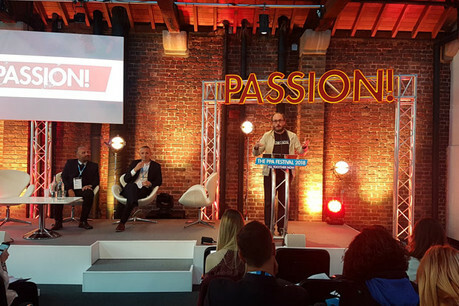 Speaking at the PPA Festival in London today (10 May), Chris Hewitt, associate editor, Empire, gave his four P's for podcasting success. "You don't have to wait for permission to do a podcast," he said, noting that everyone with a phone is able to produce one. "We had been toying with the idea for some time, and we had asked the higher-ups if we could do it, they were dilly-dallying so we just went and did it." The first that the then-editor Mark Dinning knew of the podcast was on press night, when Hewitt snuck a mention of it into the magazine. "Make sure your podcast represents your brand," he said. Empire's mission is to educate, entertain and inform, so the team makes sure they have informed chats within the podcast that also project an atmosphere of fun. "But remember that reflecting your brand doesn't mean replicating your brand," he warned. "In the planning phase, we toyed with the idea of using the podcast to produce audio versions of franchises that were in the magazine, but didn't do it – we wanted to forge our own path. "We wanted to transfer the daily conversations we have in the office into a podcast. Empire should be your best friend down the pub who knows a lot more about movies than you but can talk to you on the same level." "You must love what you do – be invested. It's not a sweet way of making cash, trust me, and listeners can smell a cash-grab a mile away," he said, explaining that he hosts, produces and edits the podcast. "It takes up half my working week, my weekends and often my evenings, but I love it. "Our passion for it as a team stands out in the very crowded marketplace – everyone in this room could go home and publish a podcast tonight, but if you don't have that passion, you won't stand out." Hewitt explained that although Empire magazine makes money from the podcast, it's a bit like 'playing snooker with a rope – possible, but you won't have a lot of joy doing it', he said, quoting comedian Jeff Green. "Advertising is out there, and we put this within our episodes, and we are sponsored by Square Space and Sky Cinema," he said. "We also do live shows every year, and recently sold out a 400-seat theatre – we split it even 50:50 with the venue." He also noted that it's rare but do-able to have a subscription model. Whatever you do though, he explains, you will undoubtedly generate 'cash' phrases within the podcast that can be placed on items like mugs and t-shirts, which can also generate income. Have you got an innovative podcast idea that you want to shout about? Tweet us from your newsroom to @journalismnews.